Gilead Sciences stock (NASDAQ: GILD) fell by as much as 4% on Tuesday morning, after the biotechnology company posted earnings that missed Wall Street expectations. Our analysis of the stock’s market cycle suggests there may be pain in the coming months. Gilead reported earnings per share of $1.44 and total revenue of $5.8 billion, above analyst estimates of $1.71 and $5.5 billion. Management projected revenue for the fiscal year of $21.3-21.8 billion, which was in line with the average estimate. 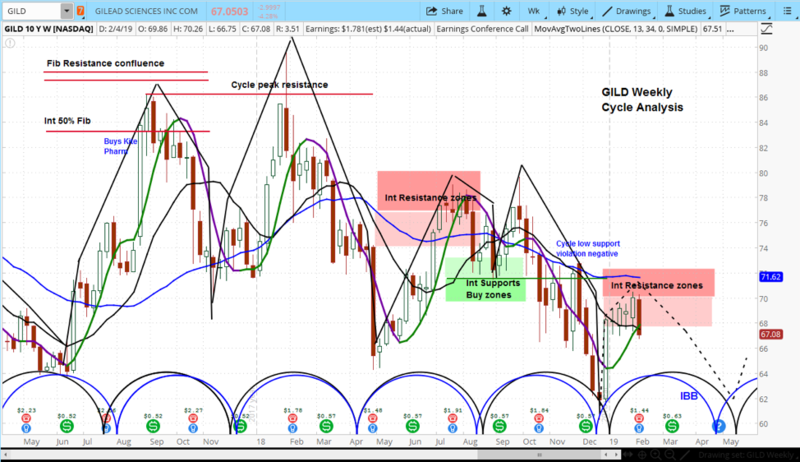 $GILD Gilead Stock Outlook: Our analysis of the market cycles for GILD is that the stock has likely begun the declining phase of its current cycle. Further, our analysis has shown the stock to be trading in negatively configured cycles. Having now failed in a key resistance zone, we believe the risks are rising for further declines. Indeed, by April, we expect a test of its December low.